I finished 2016 income tax preparation for our accountant. by most Humana Medicare plans at my local gym. a cup of tea and gaze at my spring blooming daffodils. Today I took my tea party outside to the patio. to arrange the bouquet in my Mother Goose vase. white creamer and vintage spoons are essentials for tea time. The geese napkin rings add a sweetness to my tea time. a vintage pattern with white, blue and some yellow print. and Lemon Meringue pie and a flaming birthday cake. LOL!! plus washed the inside of the dining room windows. What a blessing it is to have a young helper. March Garden Journal coming soon. You are so right blue and white china pairs so well with yellow and white narcissus flowers, the quilt makes a perfect cloth to set your treasures upon what a great find. How lovely that your granddaughter was able to come over to help you prepare for the Big Birthday Bash, I hope you all have a wonderful time. Nice to have your company for MM again this week. Betty, You created a lovely tea time. I love the blue and white dishes and I was really happy to see the Nordic teacup and saucer. I was given some pieces of this dishes but the teacups. I am on the hunt and now I know what they look like. I love the geese napkin rings. I hope thei birthday party goes well. Thanks for sharing. Sylvia D.
Love the yellow daffodils in the white duck. Beautiful with your blue and white china. What a charming tea setting! You cute geese made me smile. Such a spring inspiring vignette!!! I just love it! As I sit here with a couple of inches of new fallen snow, I am jealous of your daffodils. How nice to share this with your granddaughter. Good for you for joining silver sneakers and taking more time to take care of yourself. Betty, what a lovely tea setting! I love blue and white china and yellow flowers, so I would've felt right at home. Such lovely spring like photos and colors! Thanks for sharing. 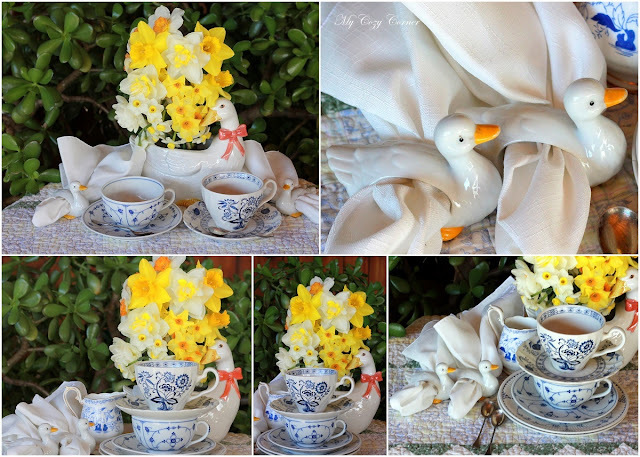 Such sweetness - I love the pitcher - and the napkin rings - and the daffodils and the blue and white tea service. Just the thing for spring. We are still having blustery, rainy winds here in the Pacific Northwest - but the bulbs are shooting up - should have flowers soon. Beautiful daffodils that look great with your blue and white teacups. Darling geese container and napkin rings too. I loved your happy and cheerful tea party. I like your blog and comment.